Keeping fit during the fall and winter months is a challenge for everyone, but especially for household pets who do not want to spend much time outdoors in the freezing weather, rain, snow, and ice. It is important to engage your pets in exercise, regardless of the season, according to the recommendations of your trusted veterinarian. Vet care for cats and dogs is essential to the well-being and longevity of your pet. Your veterinary team can help you determine host to best exercise a dog in Westport when the temperature drops, and suggest the most appropriate cat exercise in Massachusetts for indoor cats. Smaller animals often have a harder time with extreme weather conditions, which is why you will often see smaller breeds wearing sweaters or jackets as soon as the weather turns cool. Westport pet owners who want to make sure that their small breed dogs or short hair cats are staying warm during the colder months should speak with their veterinarian about appropriate indoor temperatures and safe methods for providing heat. Some methods, while recommended by experienced pet owners, may not be suitable for your type of pet. It is always best to seek professional advice if you are unsure. Small dogs can be easily exercised indoors if the snow gets too deep by playing a game of fetch, hiding tiny treats, or even engaging in a game of chase around the furniture. Even just a few minutes of activity each day is better than months of sedentary life, curled up under blankets and eating sweet treats that “fall off” the table. The more you can do to get your pet moving, the better. Even cats tend to get a little slow and lazy in the fall and winter months, as they tend to mimic our behavior. The more you get up and move, whether it is doing some fall cleaning, dancing around the living room, or actively playing with your pets, the more likely they will be to engage with you and play along too. One of the biggest mistakes that large pet owners make in the fall and winter months is not providing proper shelter, warmth, and foot care for larger pets. Large breed dogs, including huskies, German shepherds, Rottweilers, and bully breeds, require just as much attention and concern in the cooler seasons as the little dogs do. While they may enjoy romping around in the snow and still beg to go on neighborhood walks, it is a good idea to work with your local vet to find ways to protect them from the dangers that are lurking outdoors. 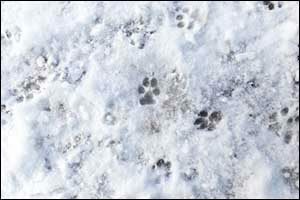 Salt and other de-icing chemicals can wreak havoc on your pet’s feet, causing burns, blisters, and aches. While your pet probably won’t like to wear boots, if you walk on sidewalks where you know these treatments are being applied, it is in their best interest to have their feet protected. Ask your veterinarian about alternative protection methods that can be used to prevent damage from chemicals or ice burns from over-exposure. If your pet wants to play outdoors, make sure you supervise play and provide a warm shelter. Never leave a dog outside all day in the snow and ice in the Southcoast area. The weather is just too extreme here to leave pets out unattended and unsupervised throughout the day or night. If you are looking for new ways to exercise a dog in Westport or provide healthy cat exercise in Massachusetts, make sure to speak with your trusted veterinarian at Anchor Animal Hospital in Dartmouth. We offer a wide variety of services and vet care for cats and dogs, exotic pets, rodents, and pocket pets at our veterinary hospital. Whether you need winter tips for small pets, fall preventive treatments for big pets, or basic advice for the ongoing care and feeding of your furry family members, give us a call at 508-996-3731. Regular vet check-ups, emergency care services, advanced dentistry, and other essential services are all available to our patients, helping us to provide quality care for pet owners in Southeastern Massachusetts and Rhode Island.